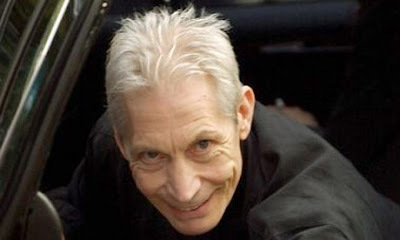 Charles Robert "Charlie" Watts (born 2 June 1941) is an English drummer, best known as a member of The Rolling Stones. He is also the leader of a jazz band, a record producer, commercial artist, and horse breeder. Watts was born to Charles Watts, a lorry driver for a precursor of British Rail and his wife Lilian (née Eaves) at University College Hospital, London, and raised (along with his sister Linda) in Islington and then Kingsbury. He attended Tylers Croft Secondary Modern School from 1952 to 1956; as a schoolboy, he displayed a talent for art, cricket and football. Watts' parents gave him his first drum kit in 1955; he was interested in jazz, and would practice drumming along with jazz records he collected. After completing secondary school, he enrolled at Harrow Art School (now the University of Westminster), which he attended until 1960. After leaving school, Watts worked as a graphic designer for an advertising company called Charlie Daniels Studios, and also played drums occasionally with local bands in coffee shops and clubs. In 1961 he met Alexis Korner, who invited him to join his band, Blues Incorporated. At that time Watts was on his way to a sojourn working as a graphic designer in Denmark, but he accepted Korner's offer when he returned to London in February 1962. Watts played regularly with Blues Incorporated as well as working at the advertising firm of Charles, Hobson and Grey. It was in mid-1962 that Watts first met Brian Jones, Ian "Stu" Stewart, Mick Jagger, and Keith Richards, who also frequented the London rhythm and blues clubs, but it wasn't until January 1963 that Watts finally agreed to join the Rolling Stones. 1615 – First Récollet missionaries arrive at Quebec City, from Rouen, France. 1866 – Fenian raids: Fenians are victorious in both the Battle of Ridgeway and the Battle of Fort Erie. 1896 – Guglielmo Marconi applies for a patent for his newest invention: the radio. 1910 – Charles Rolls, co-founder of Rolls-Royce Limited, becomes the first man to make a non-stop double crossing of the English Channel by plane. 1941 – World War II: German paratoopers murder Greek civilians in the village of Kondomari. 1946 – Birth of the Italian Republic: In a referendum, Italians vote to turn Italy from a monarchy into a Republic. After the referendum the king of Italy Umberto II di Savoia is exiled. 1966 – Surveyor program: Surveyor 1 lands in Oceanus Procellarum on the Moon, becoming the first U.S. spacecraft to soft land on another world. 1979 – Pope John Paul II first official visit to his native Poland, becoming the first Pope to visit a Communist country. 1990 – The Lower Ohio Valley tornado outbreak spawns 66 confirmed tornadoes in Illinois, Indiana, Kentucky, and Ohio, killing 12. Petersburg, Indiana, is the hardest-hit town in the outbreak, with 6 deaths. 1997 – In Denver, Colorado, Timothy McVeigh is convicted on 15 counts of murder and conspiracy for his role in the 1995 bombing of the Alfred P. Murrah Federal Building in Oklahoma City, Oklahoma. 2010 – Derrick Bird goes on a killing spree in Cumbria, killing 13 and injuring 11, see Cumbria shootings.